Residents are being invited to let their loved ones shine bright this Christmas by dedicating a memory star to them. Christmas trees are being spruced up in preparation for families and friends to place memory stars on their branches throughout December. The trees will be placed in Southern Co-op funeral home branches across the south of England to give everyone the opportunity to write a personal message to someone who is no longer with them this Christmas. Ingrid McAllister-Derry, from Southern Co-op’s free Bereavement Centre, said: “After someone close to you has died, any celebration can be particularly hard. 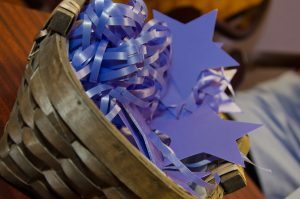 “The memory stars give people the opportunity to re-live happy moments and make sure their loved ones are still included in this special time of year. Residents are also invited to attend special events in December when they can pop in and have a mince pie. The events will be held on either Wednesday 19th or Friday 21st December from 12-3pm – see your local branch for details. All memorial trees will be up and ready for stars by Friday 30th November and will remain within the reception area of each funeral home until the end of the Christmas season so that friends and family can visit to read the messages and add their own if desired. For more information about Southern Co-op’s bereavement support, click here.